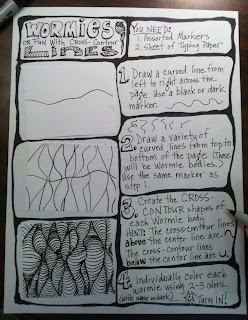 Lots of friendly folks have asked me to post information about "My Process" or to describe how I create my dictionary drawings. I am happy to share so here's how I do what I do. 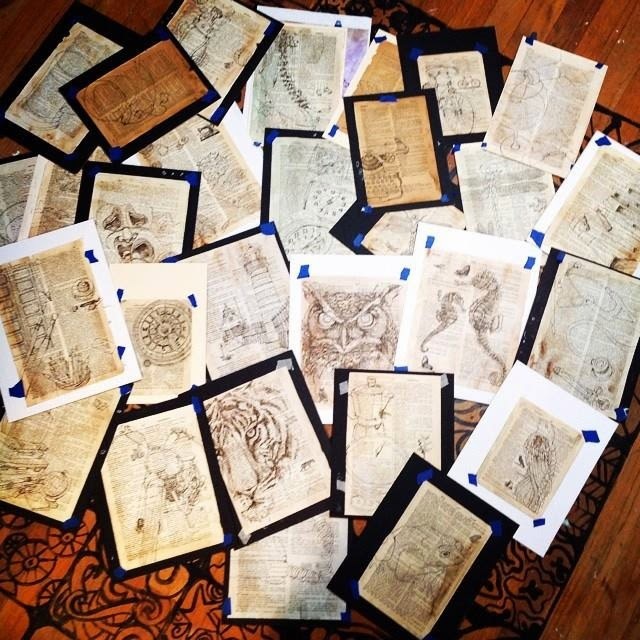 It all started with a torn up, damaged dictionary in my high school art classroom. I am always digging through damaged books for materials my students might use in crafting, collage or altered book projects. I have stacks of old books that are being thrown out of our high school library that we use for all sorts of classroom projects. We mostly paste these pages on boards and journals. So the first thing I want to clarify is that I don't destroy good books. I am a lover of books and our house holds a treasury of books in almost every room. I've been confronted and chastised occasionally for tearing up books as support for my drawings but I see my process as preserving and rescuing books that might otherwise end up in a dumpster. 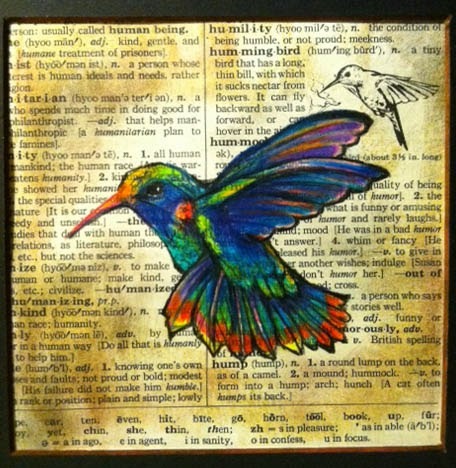 One day, while my students were working away, I picked up the dictionary pictured above and it opened to a page with a definition and tiny illustration of "hummingbird." Since my students were occupied I decided to draw a little bird on the page. I thought I might paste the drawing in one of my many altered books. When finished I posted the drawing on my Facebook page. Almost instantly a friend saw the drawing, commented and wanted it. I sent it her way. I drew on another page - another friend asked for it and so I mailed away that one, too. I drew another and another and now years later, people still want them. I am often asked which I do first - find a definition that inspires the drawing or think of an image and then search for a page with that definition? The answer is "Yes." I do both. Sometime I open a dictionary and a definition just pops off the page and an image comes immediately to mind. Sometimes I discover an image and run to find the perfect page. Regardless of the chicken or the egg, I eventually cut the page out of the dictionary and distress it somehow. By distressing I mean I lather the page with a watercolor/ink wash and preservative. This wash tends to strengthen the page a little and bring out the age on the page. I don't add any gel mediums, Mod Podge, etc. even though I've seen some blog posts where people claim to have discovered my preparation secrets. I don't do anything elaborate. I want the page to be as pure as it can be. Some pages are very brittle and some have a very smooth, hard surface. Unlike a novel, a dictionary is rarely opened and some pages may never have been touched. Some pages may have oils from handling trapped in the fiber of the page only to be shut and abandoned for years. I find some pages are very brittle and flake with the slightest touch. Others are so smooth and oily that water beads up and runs off like it's been laminated. Each book is different. Each book has had a different journey. Some smell like the pipe smoke from the library they lived in and some have brilliantly bright, perfect pages hidden inside that have never been revealed. They are a lot like people - they are changed and affected by the places they have been. For whatever reason, I prefer to use old books. I think I like that these books have a little history and a story. I started with a children's dictionary from the 1950's and only used that edition for quite some time. 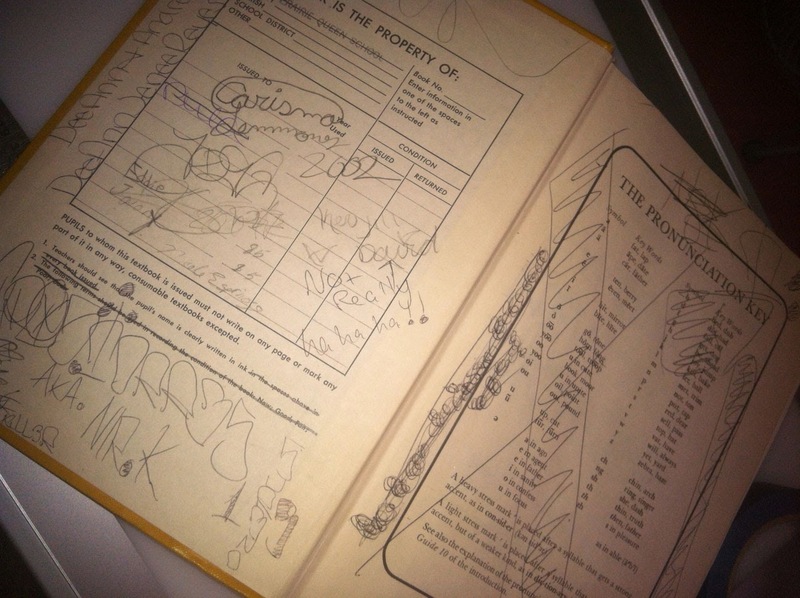 I have since discovered methods to draw on older and older books. 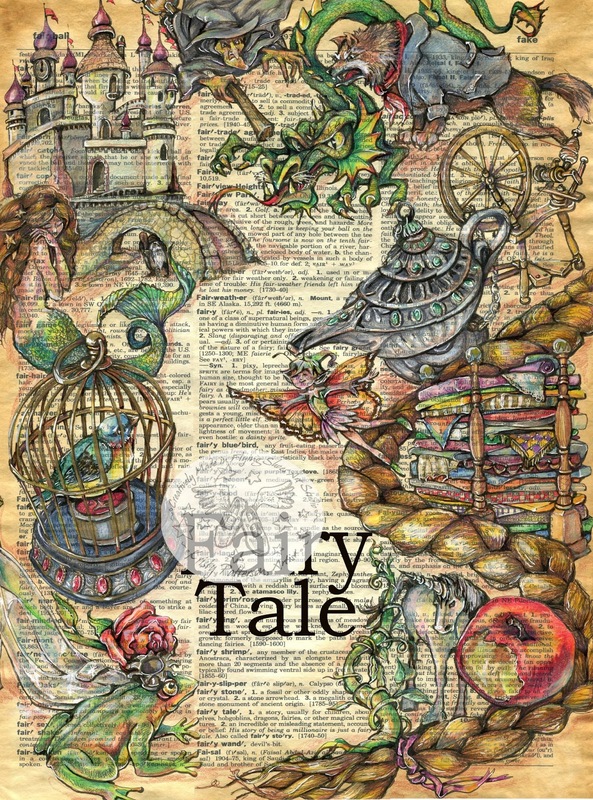 My youngest books come from the 1970's and I've used pages from books with copyrights all the way back to the 1800's. After the pages have been prepped, I then do an ink drawing of my subject. I sometimes do a page at a time. If I am preparing for a festival or show, I will often do stacks of ink drawings all at once. 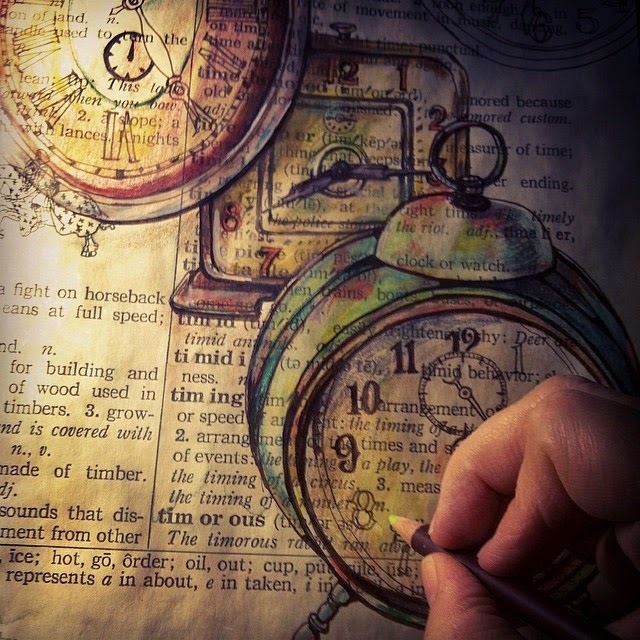 These ink drawings are created with sepia ink so the illustration has a vintage, nostalgic look. I never use black ink on the pages. I keep these pages taped to mat board to protect them from getting damaged until they are completed. The greatest challenge of creating these drawings comes with adding color. I deliberately add minimal color and challenge myself to keep my palette very limited. I want the finished drawing to look vintage so I rarely use vivid, bright colors. Because each page has a different texture, fiber content and strength, I use a wide range of colored mediums. I may use colored pencils, pastels and watercolors to get the color I want. I am particularly fond of blue greens and sienna which you'll find over and over again. My goal is to punch up the colors by blending and using compliments. The final step is to hand letter the drawing with the word I've illustrated. 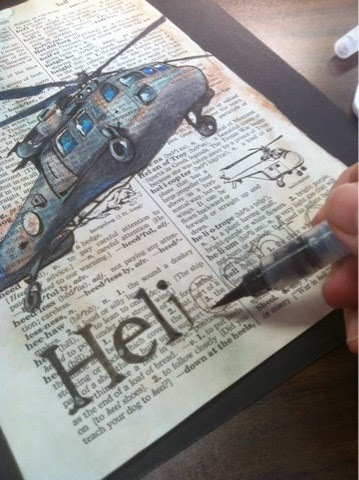 I draw out the outline of the word and then hand paint it in sepia watercolors using a Sakura watercolor brush. Way back in college I took a number of lettering, font design classes. Back then, before computers we were taught hand lettering skills and spent long hours practicing how to make straight lines with or without serifs. I actually hated hand lettering but those skills are now a part of my commercial work. I use Bookman Old Style Font on all my drawings for continuity and to match the typeface on the dictionary page. With nearly 350 of these drawings completed, I'm still going strong and still finding interesting ideas and making new discoveries. 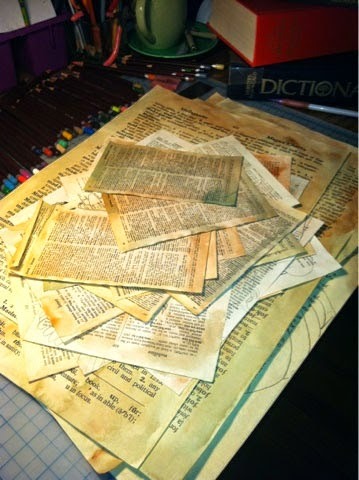 My latest challenge is working on antique parchment which has been digitally printed with the old dictionary page. By using this equally old paper I can now draw larger than any of the dictionaries I've found. I've been creating work 12" x 18" to 18" x 24." These larger pages allow me to create more images and more detail on the page. The existing text on the page is a factor in how I arrange my drawing so larger text permits me to draw more fine detail. I could never get this much detail and so many images on a standard 6" x 9" book page. I've always loved drawing and its one the primary skills I teach my high school students every year. I am so thankful to be a working artist and I am still going strong in my studio creating my dictionary art and so much more. Hi Kristy, Your work is awesome. I feel fortunate to have found your blog. I'm just learning to draw at an older age, so your blog is an inspiration. Keep up the good work! I love your artwork. How do you prep the pages? I just discovered your work on Pintrest. It is beautiful. I've tried a little of this type of journaling but you've given me some food for thot. Many thanks Kristy. Such a unique idea and so marvelous. I have done a few watercolors on antiqued state maps for friends. Now I'm excited about doing more. It really isn't a secret at all. Now a days, I simply spray Krylon "Preserve It" on the front and back of my finished artwork. It is wonderful, permanent and doesn't alter the paper or the media I use. 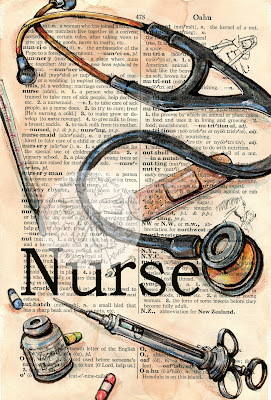 Love your work, and so glad I've found your blog. 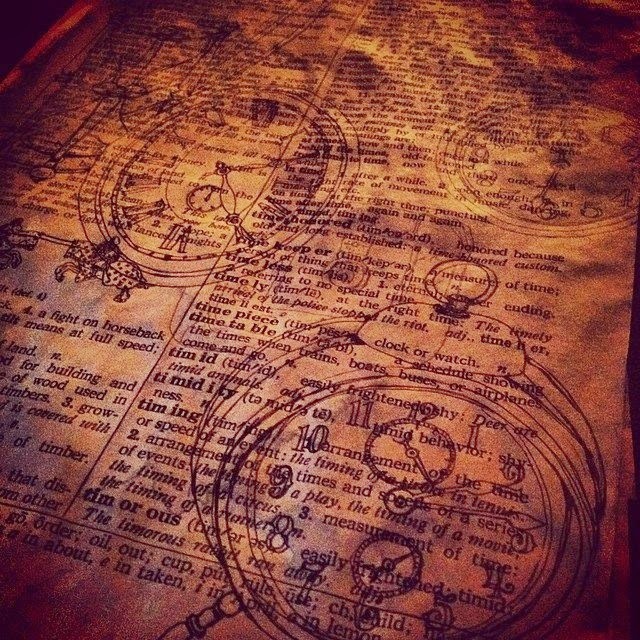 You've given me inspiration to do some artwork on old dictionary pages. Love the vintage look. Only started painting and drawing at this late stage of my life and loving every minute of it. So fulfilling. 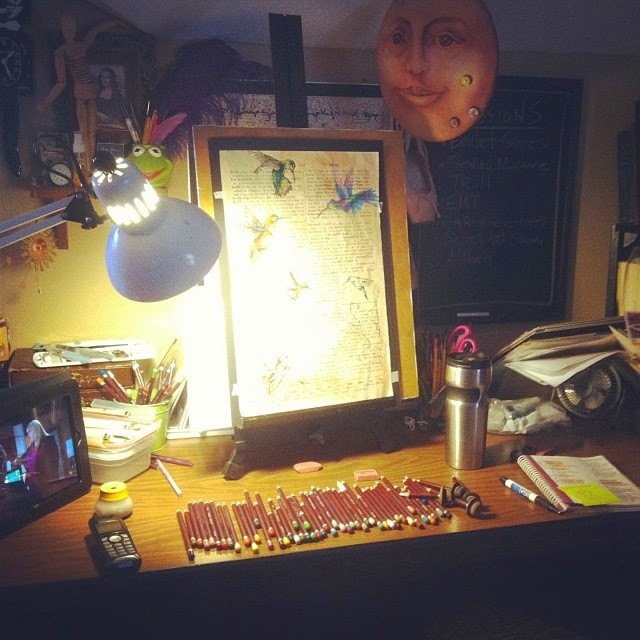 I like your studio too, it gives me encouragement to convert one of my rooms into my own "art studio". Love the sound of that!! !